Remember that book in my last post that I was trying to finish in time, but gave up? I'm finished now, as of last night! So today's review will definitely be about the dang thing. Also, if anybody is into Dallas A-Kon, I went today and am going again tomorrow. It was wonderful! I hope those of you who with your heads cocked to the side, wondering why I'm going to a singer, I'm not. Anime Convention in Dallas is A-Kon. If you're not into dressing up, you don't have to, but it's quite fun to do! I suggest you go check out an Anime or Comic Convention that's by you, because they're tons of fun; ask Ashley! Okay, book time! 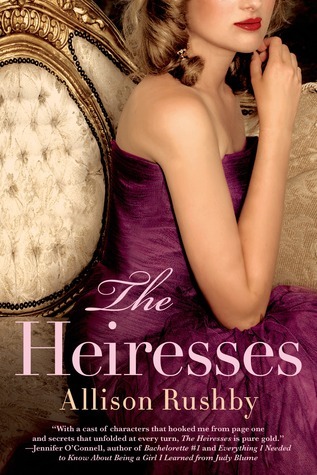 Today's is The Heiresses by Allison Rushby (same author from Shooting Stars!!!). Goodreads's Summary: "When three teenage girls, Thalia, Erato and Clio, are summoned to the excitement of fast-paced London--a frivolous, heady city full of bright young things--by Hestia, an aunt they never knew they had, they are shocked to learn they are triplets and the rightful heiresses to their deceased mother's fortune. All they need to do is find a way to claim the fortune from their greedy half-brother, Charles. But with the odds stacked against them, coming together as sisters may be harder than they think." This novel is very easy to get lost in. The characters are all so interesting and realistic. The plot is awesome and very unique. As the characters develop throughout the story, you never lose who is who, nor do you get confused on what is going on. Rushby did an amazing job keeping up with each character and plot line. The story itself has love, mystery, drama, laughs, and more! You will grow along with each character as they gaze back to their old lives as they march into an unknown outcome for themselves. I personally could relate to some of the issues that were presented, and I loved that they were just as confused as I am. In the end, you may not like how each story plays out, but I can tell that the characters were determined to go their own ways, against whatever any reader's wishes. Also, I must comment on the world-building and background. The world was visible in my mind. Though you get your barrings throughout the novel, so you're shown and not exactly told, you picture it instead of just thinking about the words or ignoring them. Love it! In Conclusion: Read this novel and feel the scary and necessary transformation to adulthood from childhood. This novel can help you learn what to listen to and help you along in the process. Plus, the scandal, romance, etc. is all WAAAAY too fun to not read this novel!!! Okay, off to read another one for y'all!! !